Impressive mission, its really astonishing, the level design is superb, alot of beautiful details, and alot of effects though all of them combined makes the mission laggy. How can i break the fire barriers like the one in the hotel room door? Trying to read Lady A's diary crashed the mission. Second time it worked fine. I temporarily removed the link. There is a problem with the German and French translations. Well, I don't know what to do with it. Someone of German and French players have to check all texts in game. Last edited by Soul Tear; 7th Jan 2016 at 18:58. There are several issues with the German translation, although nothing serious so far. A discussion might start in the German TTLG forums soon, so maybe we should just wait for one or two days. The main problem with the French translation, however, might be that it's not even present in the zip file, although the fm.ini mentions it (as well as Russian). By the way, why did you advise players to turn off "sun_runtime_obj_shadows"? Seems like Garrett is a lot more visible with it turned off. Soul Tear will you make a video walktrough for this mission? I hate to sound whiny... But I'm finding this mission very difficult. I had to check here a lot because I just can't seem to figure out the how or why. Mantling is also a bit on the hardish side. I'm finding this mission very difficult. I had to check here a lot because I just can't seem to figure out the how or why. Mantling is also a bit on the hardish side. I'm completely clueless. Don't know how to proceed. 1) I found Keeper Jonas (at the Inn, using the glyph in the small storeroom) and got the order to find out what's going on in the House of Science. HOW can I do this? Is there a way into the house? 2) I was in the backyard of the inn and tried to rope up to the mage's window, however the rope is to short, and I cannot get up there. So, what I am to do there? 2a) In the same area there is a Tower with a locked door. How can I enter this building? In Addition: when I re-entered the main plaza-area, the guards attack me now. Why? 3) The Cozy Inn. Is there a way in? 4) Where do I find a pickaxe? Any helpful hint would be very appreciated, thanks in advance. I can only help with two items Uromo, because I'm stuck with all the others myself. Item 2: the tower, whose door is blocked on the inside, has a tiny area where the top overhangs the bottom. That area will take a rope arrow. You can then climb the rope arrow as high as you can, turn around, and jump onto the ledge that will get you to the window to the mage's room. Item 4: on Expert, the pickaxe is inside that same inn, resting on the ground beside one of the guests at one of the tables on the ground floor. Last edited by Marbrien; 8th Jan 2016 at 04:06. I checked, many objects become black/very dark. But this is a personal matter. It's a good idea, but unfortunately I am very busy now. Cool i´ll be waiting for a video walktrough beacuse i really want to enjoy the visuals and ambients , until then i´m going to pause the mission, since i find it unfairly hard for "Taffer" mode. You should make missions more easygoing at least for normal difficulty, so people can enjoy more the gameplay and the artistic features, because if you´re going to add puzzles everywhere it will make players feel like they are trying to fix something all the time. "what do i do here?" "what now? ", "I don´t understand", "great stuck again". Has anyone been able to get in the sewer pipe with the rushing water that's outside the entrance? If I'm thinking of the right place, that was accessible in the previous version of the mission but doesn't seem to be now. 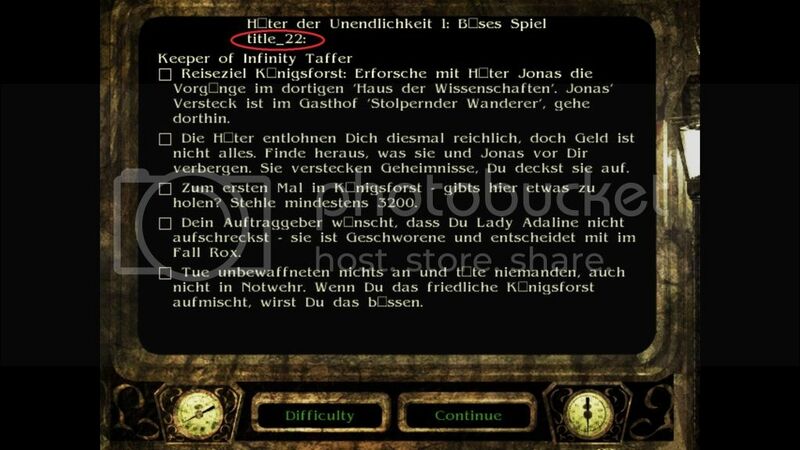 It is accessible, but later in game. LOL of all the things I sound like, a mulleted German eurodance artist isn't one I would have guessed! How to get inside the cosy inn? I've also found a crate that you can pick up, it's probably needed for climbing or something? Does anyone know? I too need to get into the Cosy Inn. There is talk in a readable of a key being found and given to the landlady, but it isn't clear which inn is being discussed (there are at least two) or where that key might be. There are players who seem to have progressed further in this game, please help us out. I just used that crate to mantle onto one of the statues at the rear of the House Of Science. From there I climbed onto the porch roof between the statues. Garrett said something about the house being a living entity, and the objective to inspect the house checked off. I didn't actually get inside the house. Not sure that's what you're supposed to do, of course. Thanks, I had tried to do that but for some reason I couldn't mantle on top of the statue. Will continue to try. I need some explicit help please in mission 1, as I’m on the point of giving up. I am playing on Keeper (Expert). a) Get inside the Clean & Cozy Inn. Thereon’s notes talk about an inn key, but doesn’t say which inn, or where to find the landlady who is supposed to have the key now. b) I have an empty jar, but cannot find a spider for Cleman (probably because of a)). c) I have used the glyph inventory item all over, but cannot find Jonas’s second hide-out. I don’t know where the sewer watchman tower is. I have a map which tells me nothing. d) I have not discovered what the keepers are hiding. e) Although I have 6325 loot and a pickaxe, the mandatory get “1000 more” loot objective has not checked off. 1. Been into Adaline’s house and got her diary. 2. Broken into the wine warehouse safe. 3. Removed the vegetation over the door and got into the blocked district. 4. Found Jonas’s first hide-out at the Stumbled Traveler inn, and found the secret there. 5. Got 5000 the loot objective. 6. Inspected the House Of Science (but possibly not in the intended manner - see post 71). The voice is really cool in the mission, but it made me remind immediately this song, i though you used some editor to get this voice result, but if its a natural accent and voice then i must say its really impressive, it inspires respect. A: Clean and cozy inn opens for business on its own as you progress, if I recall correctily. B: Related to A. But remember what you've read about the spiders preferred habitats. C: There is no "sewer watchman." There is however a manhole next to the City Watch tower in the outer city. Use your crowbar. D: Will resolve itself once you progress. E: I didn't play on expert, can't help you there, sorry. All natural recording, though I will have to admit that my normal speaking voice sounds more like the rookie guard in mission two.